Mechanical music technology is the use of any device, mechanism, machine or tool by a musician or composer to make or perform music; to compose, notate, play back or record songs or pieces; or to analyze or edit music. The earliest known applications of technology to music was prehistoric peoples' use of a tool to hand-drill holes in bones to make simple flutes. Ancient Egyptians developed stringed instruments, such as harps, lyres and lutes, which required making thin strings and some type of peg system for adjusting the pitch of the strings. Ancient Egyptians also used wind instruments such as double clarinets and percussion instruments such as cymbals. In Ancient Greece, instruments included the double-reed aulos and the lyre. Numerous instruments are referred to in the Bible, including the horn, pipe, lyre, harp, and bagpipe. During Biblical times, the cornet, flute, horn, organ, pipe, and trumpet were also used. During the Middle Ages, hand-written music notation was developed to write down the notes of religious Plainchant melodies; this notation enabled the Catholic church to disseminate the same chant melodies across its entire empire. During the Renaissance music era, the printing press was invented, which made it much easier to mass-produce music (which had previously been hand-copied). This helped to spread musical styles more quickly and across a larger area. During the Baroque era (1600–1750), technologies for keyboard instruments developed, which led to improvements in the designs of pipe organs and harpsichords, and the development of a new keyboard instrument in about 1700, the piano. In the Classical era (1750–1820), Beethoven added new instruments to the orchestra to create new sounds, such as the piccolo, contrabassoon, trombones, and untuned percussion in his Ninth Symphony. During the Romantic music era (c. 1810 to 1900), one of the key ways that new compositions became known to the public was by the sales of relatively inexpensive sheet music, which amateur middle class music lovers would perform at home on their piano or other instruments. In the 19th century, new instruments such as piston valve-equipped cornets, saxophones, euphoniums, and Wagner tubas were added to the orchestra. Many of the mechanical innovations developed for instruments in the 19th century, notably on the piano, brass and woodwinds continued to be used in the 20th and early 21st century. Findings from paleolithic archaeology sites suggest that prehistoric people used carving and piercing tools to create instruments. Archeologists have found Paleolithic flutes carved from bones in which lateral holes have been pierced. The Divje Babe flute, carved from a cave bear femur, is thought to be at least 40,000 years old. Instruments such as the seven-holed flute and various types of stringed instruments, such as the Ravanahatha, have been recovered from the Indus Valley Civilization archaeological sites. India has one of the oldest musical traditions in the world—references to Indian classical music (marga) are found in the Vedas, ancient scriptures of the Hindu tradition. The earliest and largest collection of prehistoric musical instruments was found in China and dates back to between 7000 and 6600 BC. In prehistoric Egypt, music and chanting were commonly used in magic and rituals, and small shells were used as whistles. (pp26–30) Evidence of Egyptian musical instruments dates to the Predynastic period, when funerary chants played an important role in Egyptian religion and were accompanied by clappers and possibly the flute. The most reliable evidence of instrument technologies dates from the Old Kingdom, when technologies for constructing harps, flutes and double clarinets were developed. Percussion instruments, lyres and lutes were used by the Middle Kingdom. Metal cymbals were used by ancient Egyptians. In the early 21st century, interest in the music of the pharaonic period began to grow, inspired by the research of such foreign-born musicologists as Hans Hickmann. By the early 21st century, Egyptian musicians and musicologists led by the musicology professor Khairy El-Malt at Helwan University in Cairo had begun to reconstruct musical instruments of Ancient Egypt, a project that is ongoing. The Indus Valley civilization has sculptures that show old musical instruments, like the seven-holed flute. Various types of stringed instruments and drums have been recovered from Harappa and Mohenjo Daro by excavations carried out by Sir Mortimer Wheeler. "David with his harp", from the Paris Psalter, c. 960, Constantinople. According to the Scriptures, Jubal was the father of harpists and organists (Gen. 4:20–21). The harp was among the chief instruments and the favorite of David, and it is referred to more than fifty times in the Bible. It was used at both joyful and mournful ceremonies, and its use was "raised to its highest perfection under David" (1 Sam. 16:23). Lockyer adds that "It was the sweet music of the harp that often dispossessed Saul of his melancholy (1 Sam. 16:14–23; 18:10–11). :46 When the Jews were captive in Babylon they hung their harps up and refused to use them while in exile, earlier being part of the instruments used in the Temple (1 Kgs. 10:12). Another stringed instrument of the harp class, and one also used by the ancient Greeks, was the lyre. A similar instrument was the lute, which had a large pear-shaped body, long neck, and fretted fingerboard with head screws for tuning. Coins displaying musical instruments, the Bar Kochba Revolt coinage, were issued by the Jews during the Second Jewish Revolt against the Roman Empire of 132–135 AD. Miriam and women celebrate the crossing of the Red Sea with "timbrels" (small hand drums) (from the Tomić Psalter). Among the percussion instruments were bells, cymbals, sistrum, tabret, hand drums, and tambourines. The tabret, or timbrel, was a small hand-drum used for festive occasions, and was considered a woman's instrument. In modern times it was often used by the Salvation Army. According to the Bible, when the children of Israel came out of Egypt and crossed the Red Sea, "Miriam took a timbrel in her hands; and all the women went out after her with timbrels and with dance." the lyre: a strummed and occasionally plucked string instrument, essentially a hand-held zither built on a tortoise-shell frame, generally with seven or more strings tuned to the notes of one of the modes. The lyre was used to accompany others or even oneself for recitation and song. the kithara, also a strummed string instrument, more complicated than the lyre. It had a box-type frame with strings stretched from the cross-bar at the top to the sounding box at the bottom; it was held upright and played with a plectrum. The strings were tunable by adjusting wooden wedges along the cross-bar. In the Aeneid, Virgil makes numerous references to the trumpet. 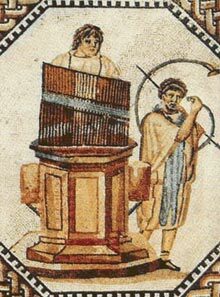 The lyre, kithara, aulos, hydraulis (water organ) and trumpet all found their way into the music of ancient Rome. The Romans may have borrowed the Greek method[page needed] of 'enchiriadic notation' to record their music, if they used any notation at all. Four letters (in English notation 'A', 'G', 'F' and 'C') indicated a series of four succeeding tones. Rhythm signs, written above the letters, indicated the duration of each note. Roman art depicts various woodwinds, "brass", percussion and stringed instruments. Roman-style instruments are found in parts of the Empire where they did not originate, and indicate that music was among the aspects of Roman culture that spread throughout the provinces. The Roman tuba was a long, straight bronze trumpet with a detachable, conical mouthpiece. Extant examples are about 1.3 metres long, and have a cylindrical bore from the mouthpiece to the point where the bell flares abruptly, similar to the modern straight trumpet seen in presentations of 'period music'. Since there were no valves, the tuba was capable only of a single overtone series. In the military, it was used for "bugle calls". The tuba is also depicted in art such as mosaics accompanying games (ludi) and spectacle events. The hydraulic pipe organ (hydraulis), which worked by water pressure, was "one of the most significant technical and musical achievements of antiquity". Essentially, the air to the pipes that produce the sound comes from a mechanism of a wind-chest connected by a pipe to a dome; air is pumped in to compress water, and the water rises in the dome, compressing the air and causing a steady supply to reach the pipes[page needed] (also see Pipe organ#History). The hydraulis accompanied gladiator contests and events in the arena, as well as stage performances. A sample of notation for the Kýrie Eléison XI (Orbis Factor), which is from the Liber Usualis, which originated in the 11th century. Listen to it interpreted. During the Medieval Music era (476 to 1400) the plainchant tunes used by monks for religious songs were primarily monophonic (a single melody line, with no harmony parts) and transmitted by oral tradition ("by ear"). The earliest Medieval music did not have any kind of notational system for writing down melodies. As Rome tried to centralize the various chants across vast distances of its empire, which stretched from Europe to North Africa, a form of music notation was needed to write down the melodies. So long as the church had to rely on teaching people chant melodies "by ear", it limited the number of people who could be taught. As well, when songs are learned by ear, variations and changes naturally slip in. At first the little dots were just placed in the space about the words. However, this method made it hard to determine what pitch a song started on, or when a song was returning to the same pitch. This quickly led to one or two lines, each representing a particular note, being placed on the music with all of the neumes relating back to them, and being placed on or above the lines. The line or lines acted as a reference point to help the singer gauge which notes were higher or lower. At first, these lines had no particular meaning and instead had a letter placed at the beginning indicating which note was represented. However, the lines indicating middle C and the F a fifth below slowly became most common. The completion of the four-line staff is usually credited to Guido d' Arezzo (c. 1000–1050), one of the most important musical theorists of the Middle Ages. It should be noted that the neumatic notational system, even in its fully developed state, did not clearly define any kind of rhythm for the singing of notes. Singers were expected to be able to improvise the rhythm, using established traditions and norms. Instruments used to perform medieval music include the early flute, which was made of wood and which did not have any metal keys or pads. 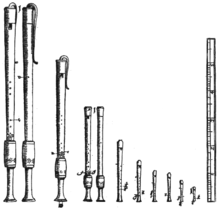 Flutes of this era could be made as a side-blown or end-blown instrument; the wooden recorder and the related instrument called the gemshorn; and the pan flute. Medieval music used many plucked string instruments like the lute, mandore, gittern and psaltery. The dulcimers, similar in structure to the psaltery and zither, were originally plucked, but became struck by hammers in the 14th century after the arrival of new technology that made metal strings possible. The bowed lyra of the Byzantine Empire was the first recorded European bowed string instrument. The Persian geographer Ibn Khurradadhbih of the 9th century (d. 911) cited the Byzantine lyra as a bowed instrument equivalent to the Arab rabāb and typical instrument of the Byzantines along with the urghun (organ), shilyani (probably a type of harp or lyre) and the salandj (probably a bagpipe). The hurdy-gurdy was a mechanical violin using a rosined wooden wheel attached to a crank to "bow" its strings. Instruments without sound boxes like the jaw harp were also popular in the time. Early versions of the organ, fiddle (or vielle), and trombone (called the sackbut) existed in the medieval era. The Renaissance music era (c. 1400 to 1600) saw the development of many new technologies that affected the performance and distribution of songs and musical pieces. Around 1450, the printing press was invented, which made printed sheet music much less expensive and easier to mass-produce (prior to the invention of the printing press, all notated music was laboriously hand-copied). The increased availability of printed sheet music helped to spread musical styles more quickly and across a larger geographic area. One limiting factor to the wider dissemination of musical styles was that monks, nuns, aristocrats and professional musicians and singers were among the few people who could read music. Mechanical plate engraving was developed in the late sixteenth century. Although plate engraving had been used since the early fifteenth century for creating visual art and maps, it was not applied to music until 1581. In this method, a mirror image of a complete page of music was engraved onto a metal plate. Ink was then applied to the grooves, and the music print was transferred onto paper. Metal plates could be stored and reused, which made this method an attractive option for music engravers. Copper was the initial metal of choice for early plates, but by the eighteenth century pewter became the standard material due to its malleability and lower cost. Slide trumpet: Similar to the trombone of today except that instead of a section of the body sliding, only a small part of the body near the mouthpiece and the mouthpiece itself is stationary. Trumpet: Early trumpets from the Renaissance era had no valves, and were limited to the tones present in the overtone series. This limited the types of melodies that Renaissance trumpets could play. They were also made in different sizes. Jew's harp: An instrument that produces sound using shapes of the mouth and attempting to pronounce different vowels with ones mouth. Shawm: A typical shawm is keyless and about a foot long, with seven finger holes and a thumb hole. The pipes were commonly made of wood and more expensive models had carvings and decorations on them. It was the most popular double reed instrument of the Renaissance period; it was commonly used in the streets with drums and trumpets because of its brilliant, piercing, and often deafening sound. To play the shawm a person puts the entire reed in their mouth, puffs out their cheeks, and blows into the pipe whilst breathing through their nose. Reed pipe: Made from a single short length of cane with a mouthpiece, four or five finger holes, and reed fashioned from it. The reed is made by cutting out a small tongue, but leaving the base attached. It is the early predecessor of the saxophone and the clarinet. Transverse flute: The transverse flute is similar to the modern flute with a mouth hole near the stoppered end and finger holes along the body. The player blows in the side and holds the flute to the right side. During the Baroque era of music (ca. 1600–1750), technologies for keyboard instruments developed, which led to improvements in the designs of pipe organs and harpsichords, and to the development of the first pianos. During the Baroque period, organ builders developed new types of pipes and reeds that created new tonal colors (timbres and sounds). Organ builders fashioned new stops that imitated various instruments, such as the viola da gamba stop. The Baroque period is often thought of as organ building's "golden age," as virtually every important refinement to the instrument was brought to a peak. Builders such as Arp Schnitger, Jasper Johannsen, Zacharias Hildebrandt and Gottfried Silbermann constructed instruments that displayed both exquisite craftsmanship and beautiful sound. These organs featured well-balanced mechanical key actions, giving the organist precise control over the pipe speech. Schnitger's organs featured particularly distinctive reed timbres and large Pedal and Rückpositiv divisions. Harpsichord builders in the Southern Netherlands built instruments with two keyboard (two manuals) which could be used for transposition. These Flemish instruments served as the model for Baroque-era harpsichord construction in other nations. In France, the double keyboards were adapted to control different choirs (groups) of strings, making a more musically flexible instrument (e.g., the upper manual could be set to a quiet lute stop, while the lower manual could be set to a stop with multiple string choirs, for a louder sound; this enabled the harpsichorist to have two dynamics and tone colours from one instrument). Another approach that could be used on a two manual harpischord would be to use a coupler to make one manual play two choirs of strings (e.g., an 8' set of strings and a 16' set of strings an octave lower), so that this manual could be used for a loud solo sound, and then having another manual set to trigger only one manual, creating an accompaniment volume. Instruments from the peak of the French tradition, by makers such as the Blanchet family and Pascal Taskin, are among the most widely admired of all harpsichords, and are frequently used as models for the construction of modern instruments. In England, the Kirkman and Shudi firms produced sophisticated harpsichords of great power and sonority. German builders extended the sound repertoire of the instrument by adding sixteen foot choirs, adding to the lower register and two-foot choirs, which added to the upper register. The piano was invented during the Baroque era by the expert harpsichord maker Bartolomeo Cristofori (1655–1731) of Padua, Italy, who was employed by Ferdinando de' Medici, Grand Prince of Tuscany. Cristofori invented the piano at some point before 1700. While the clavichord allowed expressive control of volume and sustain, it was too quiet for large performances. The harpsichord produced a sufficiently loud sound, but offered little expressive control over each note. The piano offered the best of both, combining loudness with dynamic control. From about 1790 onward, the Mozart-era piano underwent tremendous changes that led to the modern form of the instrument. This revolution was in response to a preference by composers and pianists for a more powerful, sustained piano sound, and made possible by the ongoing Industrial Revolution with resources such as high-quality steel piano wire for strings, and precision casting for the production of iron frames. Over time, the tonal range of the piano was also increased from the five octaves of Mozart's day to the 7-plus range found on modern pianos. Early technological progress owed much to the firm of Broadwood. John Broadwood joined with another Scot, Robert Stodart, and a Dutchman, Americus Backers, to design a piano in the harpsichord case—the origin of the "grand". They achieved this in about 1777. They quickly gained a reputation for the splendour and powerful tone of their instruments, with Broadwood constructing ones that were progressively larger, louder, and more robustly constructed. They sent pianos to both Joseph Haydn and Ludwig van Beethoven, and were the first firm to build pianos with a range of more than five octaves: five octaves and a fifth (interval) during the 1790s, six octaves by 1810 (Beethoven used the extra notes in his later works), and seven octaves by 1820. The Viennese makers similarly followed these trends; however the two schools used different piano actions: Broadwoods were more robust, Viennese instruments were more sensitive. The cornet, a piston-valved brass instrument related to the trumpet, could not have been developed without the improvement of piston valves by Heinrich Stölzel and Friedrich Blühmel. In the early 19th century these two instrument makers almost simultaneously invented the valves still used today. Beethoven's instrumentation for orchestra added piccolo, contrabassoon, and trombones to the triumphal finale of his Symphony No. 5 (1804–1808). A piccolo and a pair of trombones help deliver effects of "storm" and "sunshine" in the composer's dramatic Sixth Symphony. Beethoven's use of piccolo, contrabassoon, trombones, and untuned percussion in his Ninth Symphony expanded the sound of the orchestra. During the Romantic music era (c. 1810 to 1900), one of the key ways that new compositions became known to the public was by the sales of sheet music, which amateur music lovers would perform at home on their piano or in chamber music groups, such as string quartets. Since mass-market sheet music was relatively inexpensive, this enabled composers and songwriters to distribute their songs and musical pieces to a larger audience and over a larger geographic area. While the widespread dissemination of sheet music helped to spread musical styles across a larger area, the impact was nevertheless restricted to the socioeconomic segments that could read music, sing melodies from sheet music and own pianos and other musical instruments–namely the middle class and the upper class. Individuals from lower socioeconomic segments were only indirectly able to benefit from this wider dissemination of musical styles (i.e., by hearing new songs performed by professional musicians in brothels or taverns), as poor people could typically not read music or own pianos or other expensive instruments. New instruments such as the saxophone began to appear in some 19th-century orchestra scores. While appearing only as featured solo instruments in some works, for example Maurice Ravel's orchestration of Modest Mussorgsky's Pictures at an Exhibition and Sergei Rachmaninoff's Symphonic Dances, the saxophone is included in other works, such as Ravel's Boléro, Sergei Prokofiev's Romeo and Juliet Suites 1 and 2. The euphonium was used in a few late Romantic and works, usually playing parts marked "tenor tuba", including Richard Strauss's Ein Heldenleben. The Wagner tuba, a modified member of the horn family, appears in Richard Wagner's cycle Der Ring des Nibelungen and several other works by Strauss, Béla Bartók, and others; it has a prominent role in Anton Bruckner's Symphony No. 7 in E Major. Cornets appear in Pyotr Ilyich Tchaikovsky's ballet Swan Lake, Claude Debussy's La Mer, and several orchestral works by Hector Berlioz. The piano continued to undergo technological developments in the Romantic era, up until the 1860s. By the 1820s, the center of piano building innovation had shifted to Paris, where the Pleyel firm manufactured pianos used by Frédéric Chopin and the Érard firm manufactured those used by Franz Liszt. In 1821, Sébastien Érard invented the double escapement action, which incorporated a repetition lever (also called the balancier) that permitted repeating a note even if the key had not yet risen to its maximum vertical position. This facilitated rapid playing of repeated notes, a musical device exploited by Liszt. When the invention became public, as revised by Henri Herz, the double escapement action gradually became standard in grand pianos, and is still incorporated into all grand pianos currently produced. Other improvements of the piano mechanism included the use of thick felt hammer coverings instead of layered leather or cotton. Felt, which was first introduced by Jean-Henri Pape in 1826, was a more consistent material, permitting wider dynamic ranges as hammer weights and string tension increased. The sostenuto pedal, invented in 1844 by Jean-Louis Boisselot and copied by the Steinway firm in 1874, allowed a wider range of effects. One innovation that helped create the powerful, loud sound of the modern piano was the use of a strong iron frame. Also called the "plate", the iron frame sits atop the soundboard, and serves as the primary bulwark against the force of string tension that can exceed 20 tons in a grand piano. The single-piece cast iron frame was patented in 1825 in Boston by Alpheus Babcock, combining the metal hitch pin plate (1821, claimed by Broadwood on behalf of Samuel Hervé) and resisting bars (Thom and Allen, 1820, but also claimed by Broadwood and Érard). The increased structural integrity of the iron frame allowed the use of thicker, tenser, and more numerous strings, which further increased the strength of the instrument's tone. In 1834, the Webster & Horsfal firm of Birmingham brought out a form of piano wire made from cast steel; according to Dolge it was "so superior to the iron wire that the English firm soon had a monopoly." Other important advances included changes to the way the piano is strung, such as the use of a "choir" of three strings rather than two for all but the lowest notes, which made the piano louder and the implementation of an over-strung scale, in which the strings are placed in two separate planes, each with its own bridge height. The mechanical action structure of the upright piano was invented in London, England in 1826 by Robert Wornum, and upright models became the most popular model, also amplifying the sound. Upright pianos were more compact than grand pianos, and less expensive, so the invention of the upright piano helped make the piano an even more important instrument in private homes (for amateur music-making); in schools; in rehearsal halls; and in some types of performance venues. ^ Music of Ancient Egypt Archived 13 October 2015 at the Wayback Machine. Kelsey Museum of Archaeology, University of Michigan, Ann Arbor. ^ "UC 33268". digitalegypt.ucl.ac.uk. Retrieved 27 October 2015. ^ Kartomi & (1990), p. 124. ^ Powers, Wendy (2003). "The Piano: The Pianofortes of Bartolomeo Cristofori (1655–1731) | Thematic Essay | Heilbrunn Timeline of Art History | The Metropolitan Museum of Art". New York: The Metropolitan Museum of Art. Retrieved 27 January 2014. ^ "The Wagner Tuba". The Wagner Tuba. Retrieved 4 June 2014. ^ Dolge, Alfred. Pianos and Their Makers: A Comprehensive History of the Piano Volume 1. New York: Dover Publications. p. 124. ISBN 0486228568. Retrieved 28 February 2017.